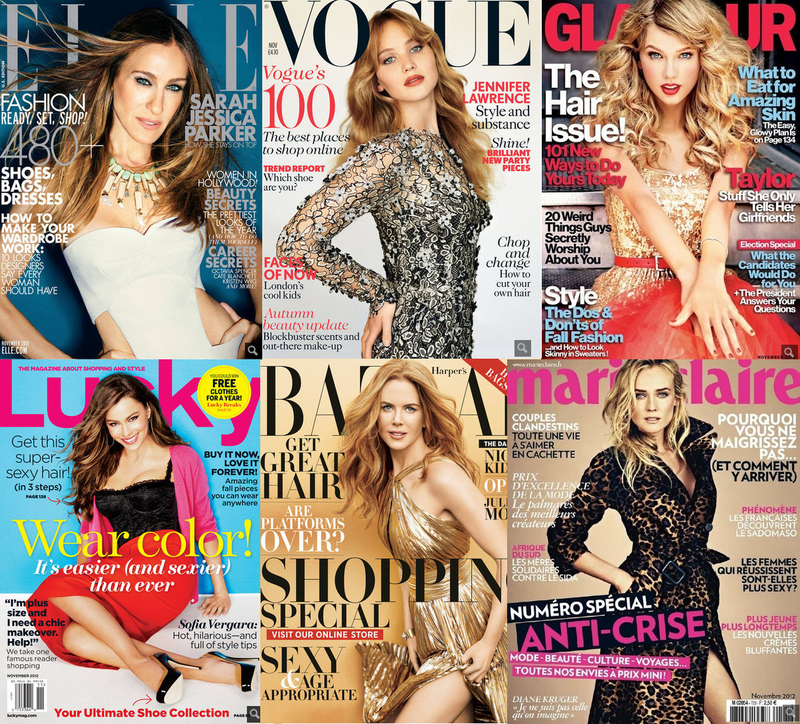 Cover Craze: November’s American & European Magazine Covers Featuring Sarah Jessica Parker, Taylor Swift, Sofia Vergara, & More! I know it’s only week two into October, but fashion magazines are always ahead of the curve & not just here in the states. Thanks to a gallery of images from Fashionologie, we can all rejoice in a sneak peek at the latest covers for November’s most fashionable magazines. This includes Sarah Jessica Parker for Elle, Jennifer Lawrence for Vogue UK, Taylor Swift for Glamour, Sofia Vergara for Lucky, Nicole Kidman for Harper’s Bazaar, & Diane Kruger for Marie Claire France. Which is your favorite cover look? Which celebrities do you follow on the newsstands? For more from Magazine Must-Haves & Cover Craze, check out October’s best including Zooey Deschanel & Emma Watson, Victoria Beckham’s assistant-editor job @Glamour, & Lady Gaga’s fabulous Vogue September issue! Happy Styling! This entry was posted in Cover Craze, Magazine Must-Haves, Style Darling Daily and tagged Cover Craze, Diane Kruger, Elle, Glamour, Harper's Bazaar, Jennifer Lawrence, Lucky, Magazine Must-Haves, Marie Claire France, Nicole Kidman, Sarah Jessica Parker, Sofia Vergara, Taylor Swift, Vogue UK. Bookmark the permalink. ← Red Carpet Review: Rachel Zoe Celebrates Paris Fashion Week In Style!